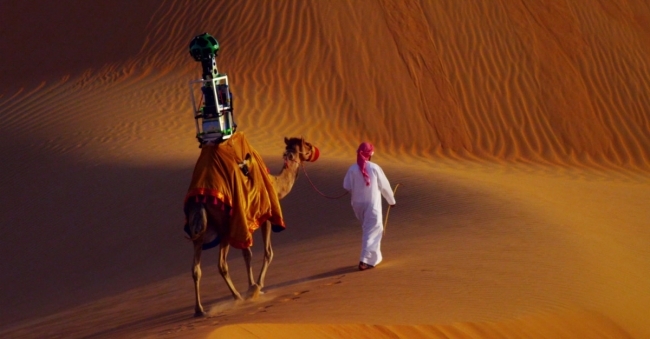 Google has hired a 10-year-old camel named Raffia and mounted a Street View camera on its back to capture panoramic images around the Liwa Oasis, in Abu Dhabi, United Arab Emirates. Google has taken the Street View cameras on boats and even underwater, but this is the first time the tech company has used an animal, said Joyce Baz, spokeswoman for Google in the Middle East and North Africa. "With every environment and every location, we try to customise the capture and how we do it for that part of the environment. "In the case of Liwa we fashioned it in a way so that it goes on a camel so that it can capture imagery in the best, most authentic and least damaging way," said Ms Baz. Utilising the desert's ancient mode of transport, an Indian guide walked the camel from as early as 6am to photograph the area in the clearest weather conditions possible, said Ms Baz.